WE STILL HAVE TO KEEP THE PRESSURE UP!! Tue, 04/26/2011 by: Linn Washington Jr.
That ruling issued on Tuesday April 26, 2011 upholds a ruling the Third Circuit issued over two years ago siding with a federal district court judge who had set aside Abu-Jamal's death penalty after determining that death penalty instructions provided to the jury during Abu-Jamal's 1982 trial were unclear. 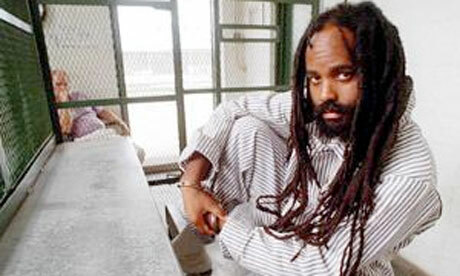 rulings eliminating Abu-Jamal's death sentence. The Associated Press was the first to report the Third Circuit's ruling that as of the morning of the ruling's release was not posted on the appeals court's website. School, could not be reached for comment. Experts contend a new sentencing hearing would be problematic for prosecutors despite the fact that such a hearing could not immediately produce a new trial and the possibility of release for Abu-Jamal. During such a hearing the defense could present the mounds of new evidence now available that undercut the entirety of the prosecution's original case against Abu-Jamal who was convicted of killing a Philadelphia policeman in December 1981. Experts expect that prosecutors will appeal the Third Circuit's latest ruling. Prosecutors concede that current and yet unresolved legal issues in this case, attracting unprecedented international scrutiny, will keep it in courts for years. she argued the legal point upheld by the Third Circuit's ruling. Recently Abu-Jamal recorded yet another birthday (4/24) inside a death row isolation cell. Abu-Jamal and the 222 other Pennsylvania death row inmates spend 23-hours per day everyday isolated inside minimalist cells. Abu-Jamal, now 57, has spent nearly thirty-years in prison for a crime he's persistently denied committing…a crime that ample evidence conclusively proves did not occur as police and prosecutors have proclaimed. once with a fatal shot in the face. examined element of this injustice condemned internationally. involving misconduct by the trial prosecutor. Pennsylvania state courts have released three Philadelphians from death row (half of PA's death row exonerations) citing misconduct by police and prosecutors…misconduct that was less egregious than that documented in the Abu-Jamal case. One of those Philadelphia exonerations involved a man framed by police for a mob-related who was arrested six months before Abu-Jamal. Officials in the French city of Saint-Denis will stage a ceremony rededicating a street they named for Abu-Jamal during the last weekend in April. Abu-Jamal by placing his name on a small one block long street. murder of a Belfast policeman. President Judge of Philadelphia's trial courts, Edward J. Bradley. gross unfairness by Philadelphia and Pennsylvania state court judges. intelligence atypical of the mainly illiterate denizens of death row. While on death row Abu-Jamal's written six critically acclaimed books (including one on jailhouse lawyers), produced thousands of commentaries, learned two foreign languages, earned two colleges degrees including a Masters and developed a loyal support network comprising millions worldwide. or criminal acts before his 1981 arrest. Supporters applaud Abu-Jamal's defense of the downtrodden particularly his poignant criticisms of America's prison-industrial complex that incarcerates more people per capita than any other country on earth. Abu-Jamal's stance highlighting deprivations of the have-nots predated his arrest earning him the title of "Voice of the Voiceless" during his professional broadcast reporting career from 1975 till his December 1981 arrest. Interestingly, Abu-Jamal rarely uses his world-wide platform to reference his own plight focusing instead on injustices endured by others. Mumia Abu-Jamal has been on death row for 29 years. Now, a court rules his sentencing unconstitutional. When will we learn? The death penalty case of Mumia Abu-Jamal took a surprising turn this week, as a federal appeals court declared, for the second time, that Abu-Jamal's death sentence was unconstitutional. The third US circuit court of appeals, in Philadelphia, found that the sentencing instructions the jury received, and the verdict form they had to use in the sentencing, were unclear. While the disputes surrounding Abu-Jamal's guilt or innocence were not addressed, the case highlights inherent problems with the death penalty and the criminal justice system, especially the role played by race. Early on 9 December 1981, Philadelphia police officer Daniel Faulkner pulled over a car driven by William Cook, Abu-Jamal's brother. What happened next is in dispute. Shots were fired, and both Officer Faulkner and Abu-Jamal were shot. Faulkner died, and Abu-Jamal was found guilty of his murder in a court case presided over by Judge Albert Sabo, who was widely considered to be a racist. In just one of too many painful examples, a court stenographer said in an affidavit that she heard Sabo say, in the courtroom antechamber, "I'm going to help them fry the n****r."
"The right thing for us to do is to ask the US supreme court to hear this and to make a ruling on it." "This decision marks an important step forward in the struggle to correct the mistakes of an unfortunate chapter in Pennsylvania history ... and helps to relegate the kind of unfairness on which this death sentence rested to the distant past." His other attorney, Judith Ritter, a law professor at Widener University school of law, told me: "This is extremely significant. It's a life or death decision." I asked her if she had spoken to Abu-Jamal yet, and she told me that the prison failed to approve her request for an emergency legal phone call. I was not surprised, given my many years of covering his case. "Another guard appeared at the cell hollering at the top of his lungs, 'This call is terminated!' I immediately called to the sergeant standing by and looking on and said, 'Sergeant, where did this order come from?' He shrugged his shoulders and said: 'I don't know. We just got a call to cut you off.'" Abu-Jamal sued over the violation of his rights, and won. "Vast numbers of men, women and juveniles … populate the prison industrial complex here in America. As many of you know, the US, with barely 5% of the world's population, imprisons 25% of the world's prisoners … the numbers of imprisoned blacks here rivals and exceeds South Africa's hated apartheid system during its height." The United States clings to the death penalty, alone in the industrialised world. In fact, it stands with China, Iran, North Korea, Saudi Arabia and Yemen as the world's most frequent executioners. This week's decision in Mumia Abu-Jamal's case stands as one more clear reason why the death penalty should be abolished.